A pre Easter trip to Cornwall to revisit old haunts and learn about new cider offerings! Since the last twelve months a few new names to the Cornish cider scene have appeared. As well as Healey’s getting lots of attention from Caroline Quentin’s Cornwall show on ITV, and Cornish Orchard acquired by London beer company – Fuller’s. Here’s a list of our favourite cider producers selling commercially, you’ll find all the details on the Real Cider makers page. 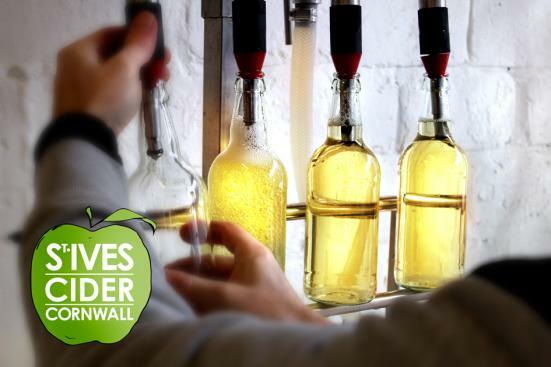 We visited St Ives cider to learn about their ciders and production methods. St Ives Cider is a family business owned by David and Kate Berwick. As a cider maker, David combines his experience in the wine industry with traditional cider techniques to produce a range of hand-crafted artisan ciders. Smeatons Sparkling, Clodgy Cloudy and Bamaluz Sweet are available year round. David also creates limited edition runs and seasonal ciders such as Montol Mulled which warmed the winter of 2012. As the orchards at David’s, are not ready for a few years, apples are currently pressed in Herefordshire and Devon, and then blended, fermented, and bottled on-site at St Ives cider. Each cider product is made in 10,000 litres batches, and as the juice is stored and delivered whenever David requires, they can produce year round, which means local trade, new and existing clients are not disappointed. The Stable bar at Fistral beach was opening the week we were there, sadly we did not have time to visit. However, if they are anything like the other Stable bars – get along for REAL ciders and perries, sea views of the Atlantic and yummy pizza’s. Trevaskis Farm – A food lover’s paradise. Farm shop, butchery, kitchen garden, restaurant and pick your own. They also stock local ciders (including some of the above cider makers) and local ales. We will be in the autumn to pick the beautiful array of local fruit! When you think of Germany, you’re unlikely to think of Cider. But the Viezstrasse (literally ‘Cider-street’) offers a cider experience so unbelievably good you’ll wonder why you’d never heard of it. It is always very exciting when I have information of new cider makers that I have not properly investigated. So with a free weekend at blossom time, my family and I jumped into our camper van and drove directly West from Sussex to Dorset. We were going to use the 2012 Olympic venue and holiday town of Weymouth as our base, and staying at the new Premier Inn. Opened only 3 weeks ago! Well, this county has always had cider, it has just not been in the spot light as often as its neighbours – Devon and Cornwall. However, over the last 3 or 4 years there has been a subtle emergence of exciting, passionate, small scale cider makers – that have a healthy supply of local West country cider apples. It is also the home of the Powerstock Cider Festival – held every May. Which takes place in a village hall. It’s a great opportunity to taste the different ciders that are made from local apples unique to the area, as well as a chance for the cider makers to share knowledge and ideas about cider making. Over a glass or two of the good stuff of course. What to do in a weekend? Start with dinner at Stable Bar in Weymouth, (they also have one in Bridport) I first had to aclimatise myself in the Dorset pace of life, and then take a few moments to browse the extensive draught and bottled cider menus. Everyone is happy, they make yummy pizzas the traditional way, and have long tables which make tasting the ciders a really social event. A modern cider house? It is certainly encouraging to see lots of different ages enjoying only real cider. After breakfast and a play on the beautiful sandy beach in Weymouth, we hopped into our van, and visited the Millhouse cider museum for the morning. They have a historic collection of cider presses and equipment which has to be seen to be believed. The shop is small, but carries a plentiful supply of Dorset and West country bottled ciders and perries, they also have their own cider on draught which is very pleasant. If you are in the area in the autumn, they open up the apple presses for everyone to juice their own fruit. If you are visiting a cider maker and their premises, it is always worth checking they allow visitors, and always phone ahead to check this is OK. This is what I did with my visit to Dorset Nectar in the afternoon. You can see the photos in the slideshow below of the orchards in blossom. They have orchards will can produce close to 300 tonnes of apples per year. Last year was 48 tonnes, which just show how poor production was in this area due to flooding and other extremes of weather. They have been managing an orchard of, 25-30 year old trees for 6 years now, and have fully embraced the good life. As well as an orchard of 3000 trees, you will find under the trees – pigs, bees, chickens, and vinegar production, all of which they sell – as well as the sculptures they exhibit around the country. I’m not sure how they have time to do this all! We had Sunday lunch at the Castle Inn at Lulworth. Their sign outside the pub boasts a permanent cider festival. This is the result of hard work of campaigning for real cider and perry at the pub by Alex Halliday. Being awarded rural pub of the year last year (East Dorset region). The walking around this area of the Jurassic coast is sublime. If you are visiting Purbeck – The Square and Compass, which has been in every edition of the Good beer guide since the first edition is an absolute gem, and the Purbeck Cider company, Dorset’s newest cider maker – are not to be missed. You would be hard pushed to find more ‘real’ cider than these tipples – there was some cider in the Nectar bottle, but it didn’t last long. The producers listed above are all found in Dorset, from east to west of the county. You are never far from quality! The majority of them winning recent National awards, so other cider lovers think so too. 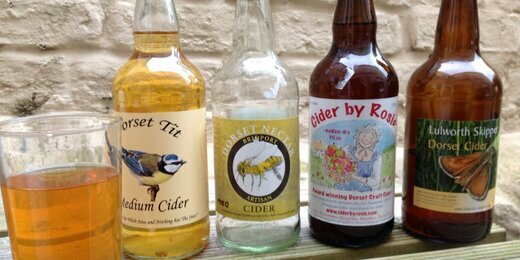 Know any other great cider makers in Dorset? Leave your comments below if you know of any good cider or perry makers in Dorset, to share with the readers on the Real Cider community website. And I will add them to the listing page (link below). The province of Asturias in northern Spain is home to the world’s most enthusiastic cider drinkers. In towns like Villaviciosa, known as ‘Apple Town’ to the Spaniards, drinking cider is almost a religion, and the twenty-plus cider bars (‘sidrerias’) are the places of worship. Let’s take a stroll around Villaviciosa, and stop at a selection. It’s all pure, unadulterated, Natural Cider. We had visited this fantastic area of France in 2009, however this time we had more time to explore the cidrerie’s we didn’t visit the last time. 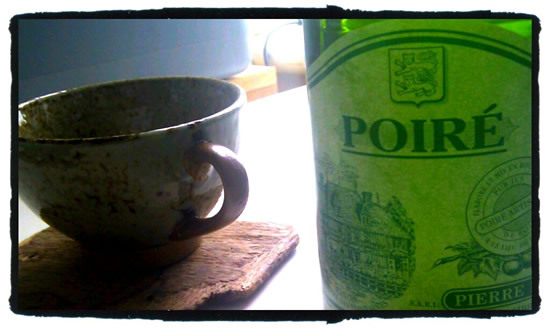 This time we enjoyed cider with our fish and crepes whilst camping in Brittany. Cider is also made here in south western France, in the French part of the Basque Country. It is a traditional drink there and is making a recovery. Ciders produced here are generally of the style seen in the Spanish part of the Basque Country. Also cider is generally served in traditional ceramic bowls (or wide cups) rather than glasses. We visited the Du Pont cidrerie where it wasn’t just the cider that was fantastic, the chateau and the estate are well cared for, and being there just before the harvest to see the fruit. A real treat. The Du Pont’s are experimental in their cider making, bringing in new apples to blend with more traditional local apples – resulting in a refined taste and numerous awards from their knowledge and expertise in their industry. They are the only Ice Cider producer in France! We also visited Pierre Huet in Cambremer who look like they are rapidly expanding with the increasing interest and tourism to the village with a new visitor centre and shop. Cambremer is a picturesque and peacefull village whatever time of year you visit, and the heart of the Route de Cidre area. As we were staying near Houlgate, we also learnt about the regular farmers market at Dives Sur Mer. Shopping in the traditional Tuesday market in Dives is quite an event, not least because it all takes place inside the spectacular timbered halls with a red-tiled roof, built in the 15th century so that the local monastery could levy market taxes. Here you will find a range of local ciders, bread, cheeses, honeys and meat on offer. The french certainly have an unrivalled passion for superior food and drink which is not hard to see when you visit this enchanting region of North France.